Please View With Internet Explorer Browser For Proper Viewing !!! N.I.M. INTERNATIONAL is a Pro-NATO 'Pro-NORTH ATLANTIC TREATY ORGANIZATION.' = N.I.M. is a Pro-ISRAEL Organization.' = N.I.M. is a Pro-EU 'Pro-EUROPEAN UNION Organization.' = N.I.M. is an Interantional Organization which perpetuates U.S. Legal Justice Worldwide. = N.I.M. was born out of a COLD WAR Victory during the Final Weeks of "April, 1989," in 'Osterholz-Scharmbeck and Bremerhaven, Germany.' = N.I.M. has an official founding date of "May 1, 1989." = N.I.M. maintains Solid Friendships with Former West Germans, in addition to, all other Former COLD WAR NATO Allies, while fighting for the freedom of all nationalities who were trapped behind the IRON CURTAIN during the COLD WAR. = N.I.M. Supports the Independence of GEORGIA and UKRAINE from Russia. = All Nationalities, Legal Citizens of All Nations, All Races, All Ethnic Groups, and All Established Religions, are welcome to join N.I.M. INTERNATIONAL POLITICAL LOBBY - N.I.M. NATIONAL INDEPENDENTS MOVEMENT. = The two official Languages of N.I.M. 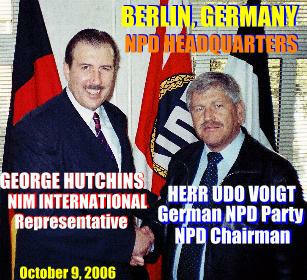 are: OXFORD ENGLISH, and HIGH GERMAN "Hoch Deutsch" = As NATO Allies, N.I.M. INTERNATIONAL desires "Justice For All Mankind Worldwide." = N.I.M. Officially Supports the U.S., EU and, NATO War against International Terrorism. N.I.M. Is A Proud International Heritage Since 1989. N.I.M. Supports the Humane Treatment of War Refugees within NATO - U.S. Controlled Military War Zones. ORGANIZATION BY THE GERMAN NPD POLITICAL PARTY. The Famed German NPD Political Party in Germany, is also known as the "NPD - NATIONAL DEMOCRATIC PARTY OF GERMANY," "NPD - Nationaldemokratische Partei Deutschlands." N.I.M. OFFICER RAN FOR U.S. CONGRESS DURING 2010 AND 2012 REPUBLICAN PRIMARIES. NORTH CAROLINA FOURTH REPUBLICAN U.S. CONGRESS DISTRICT. N.I.M. 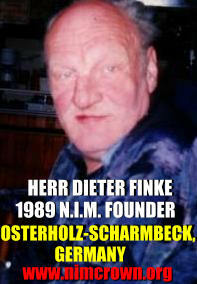 1989 FOUNDER, HERR DIETER FINKE PASSED AWAY OCTOBER 20, 2001. AS A MEMBER OF THE WEST GERMAN AIR FORCE, "LUFTWAFFE," HERR DIETER FINKE ASSISTED TO DEFEND NATO, AND WESTERN CIVILIZATION AGAINST SOVIET COMMUNIST AGGRESSION DURING THE COLD WAR. ORIGINAL N.I.M. FOUNDER INSTRUCTS A NEW N.I.M. GENERATION DURING 1992. HERR DIETER FINKE'S FATHER, WAS A GERMAN SOLDIER, WHO FOUGHT SOVIET COMMUNISTS DURING THE SECOND WORLD WAR ON THE RUSSIAN FRONT, ACCORDING TO LOCAL HISTORIES. HERR DIETER FINKE, BORN ON OCTOBER 23, 1942, WHICH WAS DURING THE HEIGHT OF WORLD WAR TWO, IN GERMANY, GREW UP IN THE HARD POVERTY POST WORLD WAR TWO PERIOD, WITH A DESIRE TO SAVE EUROPE, AND SAVE WESTERN CIVILIZATION FROM RED RUSSIAN SOVIET COMMUNISM, DURING THE COLD WAR. 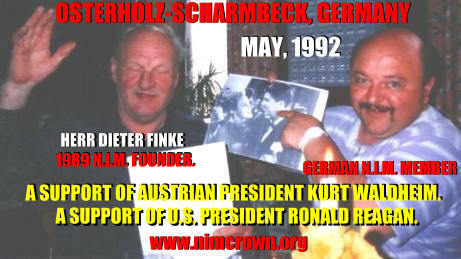 HERR DIETER FINKE SUPPORTED RONALD REAGAN, AND KURT WALDHEIM. HERR DIETER FINKE, NEVER LEARNED TO SPEAK ENGLISH, WITH THE EXCEPTION OF A FEW ENGLISH WORDS WHICH HE LEARNED WHILE SERVING IN THE WEST GERMAN AIR FORCE, "LUFTWAFFE," WHILE STATIONED IN EL PASO, FORT BLISS, TEXAS, AS A WEST GERMAN MILITARY ATTACHMENT, IN THE UNITED STATES, DURING THE COLD WAR. HERR DIETER FINKE, AS A COLD WAR WEST GERMAN AIR FORCE, "LUFTWAFFE," SOLDIER, AND ORIGINAL N.I.M. 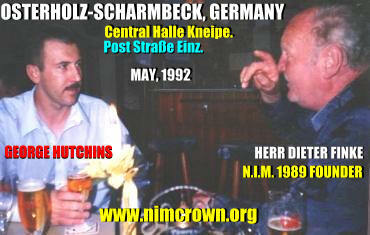 FOUNDER DURING APRIL-MAY, 1989, WILL REMAIN A HERO WITHIN THE RANKS OF N.I.M. INTERNATIONAL POLITICAL LOBBY - N.I.M. NATIONAL INDEPENDENTS MOVEMENT FOR COUNTLESS GENERATIONS TO COME. 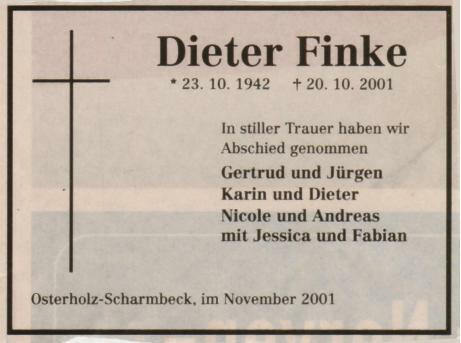 IT WAS FOR CERTAIN, ON OCTOBER 20, 2001, HERR DIETER FINKE WAS CARRIED AWAY BY THE VALKYRIE, AND NOW RESIDES IN VALHALLA. N.I.M. WILL BE RETURNING SOON. A Proud International Heritage Since 1989. * N.I.M. INTERNATIONAL perceives the COLD WAR began on May 1, 1945, when Herr Karl Dönitz became the Legal President of Germany, recognized by international law, following an appointment, signed by the German World War Two government on the previous day, in Berlin, Germany, on April 30, 1945, during the final week of official hostilities for the historic World War Two Europe: September 1, 1939 - May 8, 1945. * Many published Historians believe the COLD WAR officially began on May 6, 1946, when the famed "Knight by British Law," Lord Sir Winston Churchill, the British World War Two, Prime Minister, gave his famous "IRON CURTAIN" speech at Westminster College, located in Fulton, Missouri. PLEASE CLICK ON VIDEO, TO VIEW !!! Winston Churchill, as a British professional politician, on May 6, 1946, at Westminster College, Fulton, Missouri, was summing up, a western effort to Halt Communism, as early as, the start of Russian Revolution, during March 8th, 1917, resulting in the fall of the Russian Tsar Nicholas II, on March 15th, 1917, reaching to the final week of World War Two Europe: May 1 - 8, 1945, where as mentioned above, N.I.M. INTERNATIONAL, can by historical documentation, can reach an official date, for the start of the historic COLD WAR. Some Historians state the COLD WAR began much earlier than the June 6, 1944, Allied D-DAY invasion of Europe, during an effort to Halt Communism, during World War Two, and prior to World War Two. Winston Churchill was correct on May 6, 1946, by this time, 'we were in a COLD WAR,' from the respect of all Western Democratic Nations; we were in a war, to halt global international COMMUNISM, in which, much earlier, western nations, PRIOR TO, AND DURING WORLD WAR TWO, to include Germany, fought very hard to halt COMMUNISM. N.I.M. INTERNATIONAL, born out of an international NATO COLD WAR Victory on May 1, 1989, with original direct formation to organize N.I.M. in Germany during April, 1989, as the COLD WAR was coming to an official close, perceives with legal documented evidence, the COLD WAR came to official end on May 6, 1992, resulting from a May 6, 1992, formal speech given by Mikhail Gorbachev, former Soviet Leader, during the COLD WAR, at Westminster College, Fulton, Missouri. During this May 6, 1992 speech, at Westminster College, Fulton, Missouri, Mikhail Gorbachev, former Soviet Leader, during the COLD WAR, said, the "COLD WAR was OVER !!!" On May 6, 1992, the former Red Communist Marxist Russian Soviet Leader, Mikhail Gorbachev, said the official COLD WAR, was finished, at Westminster College, Fulton, Missouri. Mikhail Gorbachev, said this May 6, 1992 conclusion of the COLD WAR, on the EXACT location, EXACTLY 46 years after Winston Churchill announced the start of the COLD WAR on May 6, 1946. PLEASE CLICK ON VIDEO TO, VIEW !!!! = November 9, 1989, the Berlin Wall Opened for the First Time since August 13, 1961. = October 3, 1990, the Berlin Wall officially was nullified by international law, and Germany was united, for the first time, since the official close of World War Two Europe on May 8, 1945. = March 6, 1992, NATO is the clear winner of the COLD WAR. 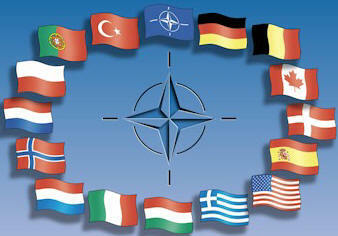 = Unification of NATO Nations, is a desired Goal. = Friendships among EU-European Nations is a Desired Goal. = Russia, China, North Korea are still a Communist Style World Threat. = International Terrorism is a World Threat. = The weakening of the U.S. Military, to back NATO Allies, is a World Threat. = The U.S. - NATO Military support of ISRAEL, is vital to the Christian Bible.